PeloPics: Sunday saw a stunning performance from 'Young Gun' Mathieu van der Poel in the Amstel Gold Race. After it looked like his race was as good as over, MvdP pulled the chase group back into contention and then won the sprint from a selection of top riders. Here are the best photos from Limburg by Cor Vos. Amstel'87 - A Gold Race Photo Gallery! 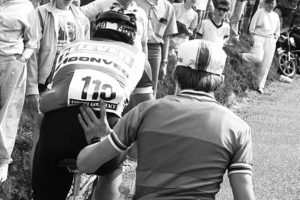 PeloPics: The 2019 Amstel Gold Race is this Sunday and teams from all around the World will be competing, but 30 years ago things were a little different. Back in 1987 the 7-Eleven team from the US and Britain's ANC squad were still a bit of a novelty. We take a retro look at the Dutch Classic in 1987 through the lens of Cor Vos. Victor Campenaerts 55,089Km - New World Hour Record! PeloPics: On Tuesday Belgian Victor Campenaerts set a new World Hour Record on the Aguascalientes Bicentenary Velodrome in Mexico. 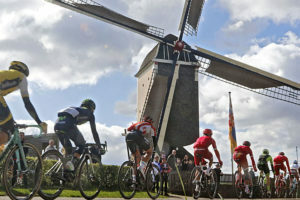 The Lotto Soudal rider set a distance of 55,089 kilometres in one hour, beating the previous record set by Bradley Wiggins of 54.526 kilometres. 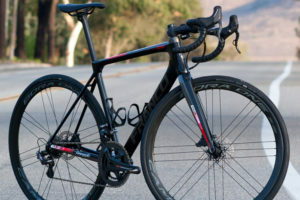 Ocean-side Gear Fest rolls out Parlee’s latest RZ7, Repente Saddles Magnet TT, POC’s Latest Headwear and Ceramic Jersey and CloseTheGap’s new bits. Niner Bikes from Colorado is a well-known name in the world of mountain biking. It only makes sense then, that their RLT9RDO gravel bike is a tough mudder that opens up the possibilities of what can be done with a drop bar bike. Limar introduced the world's first foam-in-shell cycling helmet and were also the first lid-maker to sponsor a pro cycling team. They’ve also been the lightest production helmet in the world on several occasions, but they’ve only ever had “good” ventilation until now… Enter the new Air Pro. Campagnolo Launch their Tip-top Range Super Record EPS Group as well as a new version of their WTO Tubeless Aero Disc wheels in the hills of Girona Spain. DannyShane Clothing Review: Our resident 'style guru' Chuck Peña has turned his eye from on the bike elegance to a bit of off the bike refinement. The Danny Shane Fall City Line is smart, comfortable and yet functional and gets the thorough Peña inspection and review treatment. VeloToze Waterproof Gloves & Shoe Covers Reviewed! As the Scandanavian maxim says: “There’s no such thing as bad weather, only bad clothes.” So the veloToze waterproof cycling gloves and overshoes are a godsend in cold and wet weather, and now's the perfect time to try 'em out. AMSTEL GOLD RACE'19: Magical Mathieu! Race Report: Mathieu van der Poel won his home race in a fascinating finalé of the Amstel Gold Race. After a failed attack at 44 kilometers out, the Dutch champion looked out of the race, but with a hard chase, he single handed pulled the race together and won the sprint. Twenty-nine years after father, Adrie van der Poel. Race Preview: The cobbled races have now passed and the road season turns the corner and hits the climbs of the Ardennes Classics. 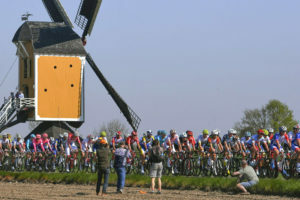 First up is Holland's only Classic - The Amstel Gold Race. Ed Hood looks at what used to be a sprinters event that is now climb packed finalé of fun from Maastricht, through Southern Limburg, over the Cauberg and finish on the Vilt-Valkenburg. Brabantse Pijl'19: Van der Poel Confirms his Class! 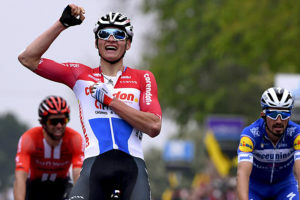 Race Report: Mathieu van der Poel (Corendon-Circus) won the 59th edition of the Brabantse Pijl on Wednesday afternoon in Overijse. The Dutch champion was the best in the sprint from a classy group, including Julian Alaphilippe (Deceuninck - Quick-Step), Michael Matthews (Sunweb) and last years winner, Tim Wellens (Lotto Soudal). TRAVEL: Have you ever wondered what it would be like to cycle the famous cols in the Pyrenees? For 12 years Allan Reeves has led a leg-crushing and ego-boosting trip across the Pyrenees most famous peaks that spans 1000 miles and climbs 100,000 feet in 12 stages. Here's what riders can expect on this the trip of a lifetime with France From Inside cycling tours. Most PEZ Readers know a bit about the 'bike hotel' concept, and many of you have enjoyed staying in one location, hospitality by gracious hosts who know the best rides, food and wine, all in a cycling dreamland like Italy. The Garda Bike Hotel was one of the first to cater to road cyclists, with over ten years experience, it's no wonder they've become THE place to stay at Lake Garda. 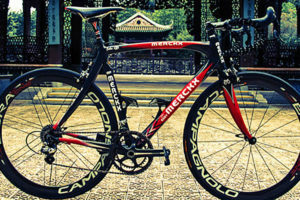 Any ride is generally a good ride but what separates a good ride from a Top Ride? Well usually it's the location but it could be your riding partner, your equipment or even the rest stops. This past summer our own Chris Selden discovered a truly top ride cycling in Piedmont in Italy where he had the perfect combination of everything. Last week I rode my favorite climb. Not at all unusual I know, but in this case it was my first “real” ride in almost two months thanks to a recurring injury that kept me off the bike and largely on crutches. I rode it because a favorite climb is like an old friend and I needed the comfort of a friend to ease back into regular riding. Film Review: For many fans, pro bike racing begins and ends at the finish line as the stars duke it out but a bike race is in fact many races. 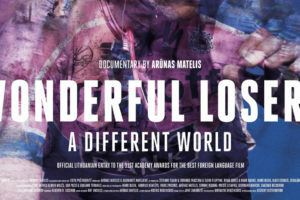 A superb documentary by Lithuanian filmmaker Arūnas Matelis, filmed in Italy over several years, takes into Deep Cycling and the world of the gregario. Malcolm Elliott Talks Amstel '87! Twenty years before the multi-million pound Sky Team rode the WorldTour, there was another 'ground breaking' British team that took on the Continentals in their own back-yard. The ANC team had its eventual problems, but it showed what was possible. One high point was Malcolm Elliott's 3rd place in the 1987 Amstel Gold Race. 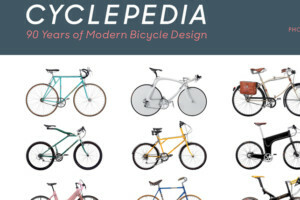 Book Review: The Embacher Collection, the subject of “Cyclepedia”, is the result of one man's interest in modern bicycle design. It is wonderful, breath-taking and crazy. 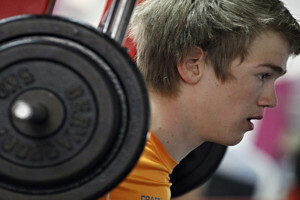 Strength Training In-Season - Folly or Fast-track? TOOLBOX: Lifting heavy weights during summer and race season may seem like the antithesis of training for cyclists. But the benefits are real - so let's breakdown how in season strength training will help you stay strong all season long. TOOLBOX: It’s that time of year for many cyclists: our base training period is ending and we’re moving into the “build phase". But these five common mistakes can stop your progress, so here's what to watch out form and how to keep your training on track. This Trek is a special bike for many reasons: it has suspension, it has ridden Paris-Roubaix, it's an ex-team bike and it holds great memories of a wonderful man who is no longer with us. 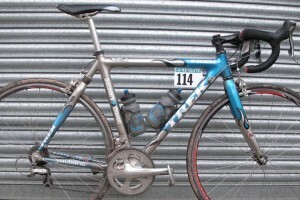 Martin Clark put the bike together in memory of his friend and took it back to Roubaix. We love a repeat customer here on Readers' Rigs and today it's Nick from California who last featured here with a fairly standard Cannondale but today he shows us his new rig, a full custom build from Franco Latigo decked out with Campagnolo gears and Bora One wheels. Rider Interview: Love him or hate him, Davide Rebellin has an impressive palmarès. He had his 2008 Olympic silver medal taken away and served his suspension, to then resume his professional career, now in his twenty-seventh season (28 if you include his banned 2010). A multi Classics winner with a shadow over his career - Ed Hood had to have a word with Davide. Rider Interview: The older guys are still banging out the wins, but a new, young set is pushing its way into the pro peloton. Ed Hood asks "What next?" The answer could be a young man from Denmark - Andreas Stokbro, the recent winner of the Under 23 Tour of Flanders. Ed had to find out more from the 'young gun'. Past Champ Interview: Cyclo-cross riders making an impression on the road isn't anything new. Back in the 70s, German 'cross champion Klaus Peter Thaler jumped into the road scene and rode with honour in the Tour de France, Vuelta a España and the one-day races. Ed Hood managed to have a word with the near 70 year-old star of mud and tarmac. April 22, 2019 - Mathieu van der Poel - What can you say. The Dutchman is the star of the future after his spring campaign was topped with his stunning win in the Amstel Gold Race - Top Story. Race news from Amstel and the Tour of Turkey with reports quotes and video. We look-forward to Flèche Wallonne and the Tour of the Alps, plus teams for Utah. 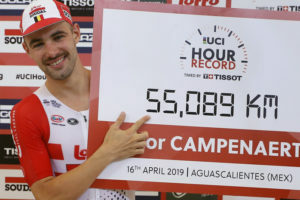 April 18, 2019 - Victor Campenaerts set a new World Hour Record on Tuesday - Top Story. Race news from Brabantse, Turkey and Camembert with video. 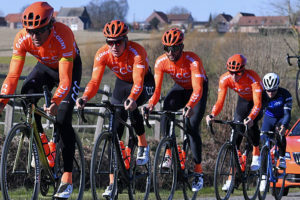 Other news: Amstel teams, Giro'20 in Hungary, Oomen to the Giro, Deceuninck 700th victory, Mohorič contract, medical updates on Benoot and Keisse, song of La Vuelta'19, Gilbert video. A full fun packed EUROTRASH Thursday. April 15, 2019 - The big story has to be Sunday's Paris-Roubaix and Philippe Gilbert's well deserved win - TOP STORY. Reports and video from Roubaix, Pais Vasco and la Sarthe. Other cycling news: Alaphilippe returns to racing, Campenaerts diary, Team Novo Nordisk to Pologne, Teams for OVO Energy Tour Series, Adorni inducted into the Giro Hall of Fame and racing at 100kph.